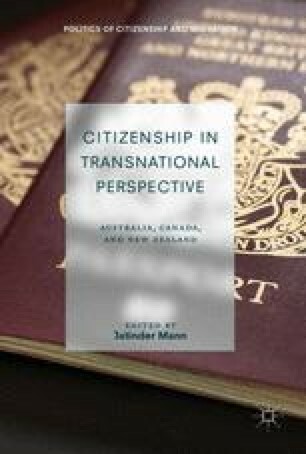 This edited collection is based on an international symposium on “Citizenship in a Transnational Perspective” that was held at the University of Alberta, Edmonton, Canada in July 2016. It brought together leading international scholars from Canada, Australia, and New Zealand to explore citizenship in a transnational perspective, focusing on the three countries through the two overarching themes of ethnicity and Indigeneity. The contributors to this collection approached the subject from a range of disciplinary perspectives: historical, legal, political, and sociological. Therefore, this book makes an important and unique contribution to the existing literature through its transnational and multidisciplinary perspectives. The contributors are engaged in cutting-edge research – including arguing for a post-citizenship world, or questioning the very concept itself, or its application to Indigenous nations.